Upright Aluminum Scaffolding. We are 14ft high on a 50″ wide narrow balcony, 5 stories up in downtown Oakland. Notice the outriggers flipped on the left side, there are many creative ways to use this scaffolding in places at first don’t seem possible. 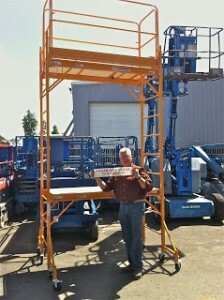 We assemble scaffolding too! 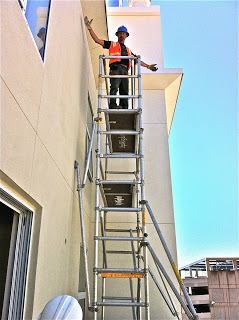 Upright Aluminum Scaffolding, 32ft up for a customer to change lights. The difficulty here was to reach this height on a wood floor, and fit between the pew. 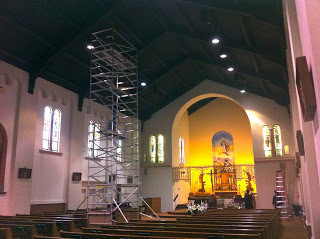 Lastly, Baker style steel rolling scaffolding, 12ft high. This style is very affordable solution for basic applications on flat ground.